Here is the seventh installment of TV Trivia For You from TV Banter. The first installment appeared on this blog on June 14, 2012. The second installment appeared on February 6, 2013, the third appeared on June 30, 2014, the fourth on November 14, 2014, the fifth on June 20, 2015.
and the sixth on March 1, 2016. DID YOU KNOW that twins are often cast as babies and very young children on television due to child labour laws? The number of hours a child actor can work is carefully limited and regulated by law. Having twins play one character means that the workload for each child is cut in half. Casting twins on daytime soaps is a common practice. Here are some examples of twins (and even triplets) who have played babies and young children on popular prime time television series. 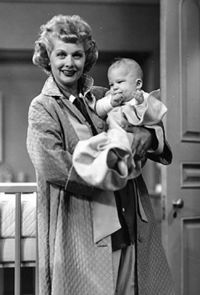 LITTLE RICKY ON "I LOVE LUCY"
On I Love Lucy, the first child to portray Ricky Ricardo, Jr. (known as Little Ricky) was not a twin. He was James John Ganzer, who played Little Ricky in just one episode, "Lucy Goes to the Hospital" (Season 2, Episode 16, Air Date: January 19, 1953). In the episode, the newborn Little Ricky is brought to the maternity ward window so that Ricky, Sr. and friends Fred and Ethel Mertz can see him for the first time. Little Ricky was next played by twins Richard and Ronald Lee Simmons (born June 26, 1952) in two episodes "No Children Allowed" (Season 2, Episode 22, Air Date: April 20, 1953) and "The Indian Show" (Season 2, Episode 24, Air Date: May 4, 1953). 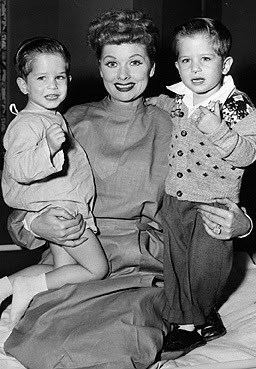 In 11 episodes, during seasons 3,4.and 5 (1953- 1956), Little Ricky was played by another set of twins, Joseph and Michael Mayer. When they were first given a contract, the Mayer twins were paid $150 a week for the 26- week season, with 12 weeks of work guaranteed. 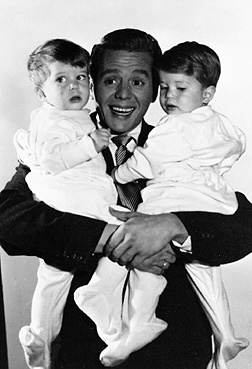 In season 6, the role of Little Ricky was taken over by one child, Keith Thibodeaux, for the rest of the series. Thibodeaux was chosen for his drumming ability and his portrayed Little Ricky at an older age. 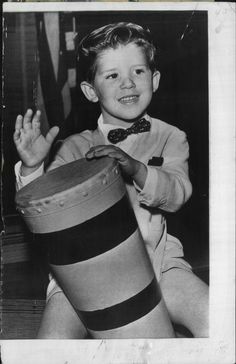 He first appeared in an episode entitled "Little Ricky Learns to Play the Drums" (Season 6, Episode 2, Air Date: October 8, 1956). Thibodeaux was born on December 1, 1950. He was almost six years old in the fall of 1956, so twins were probably not necessary for the role by then. THE TWINS WHO PLAYED TABITHA ON "BEWITCHED"
Tabitha, the daughter of witch Samantha Stephens and her mortal husband, Darrin, was played by twins Erin and Diane Murphy. 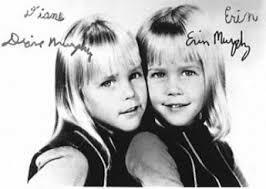 At the beginning of third season of Bewitched, Erin Murphy and her fraternal twin sister, Diane, began sharing the role of Tabitha. They first appeared in an episode entitled "Nobody's Perfect," which aired on September 15, 1966. As time passed, the twins began to resemble each other less. As a result, Erin eventually took over the role of the vivacious child witch. From 1970 to 1972, twins David and Greg Lawrence portrayed Tabitha's younger brother, Adam Stephens. Adam was born during the sixth season of Bewitched, in an episode that aired on October 16, 1969. The episode was entitled "And Something Makes Four." He was only shown as an infant that season, and the baby who portrayed him was uncredited. During the seventh season of the season, Adam was portrayed as an older dark-haired child. Although only David Lawrence's name is shown in the credits, the role was actually shared by David and his twin brother, Greg. David Lawrence now goes by the name "David Mandel-Bloch" and Greg Lawrence calls himself "Greg Mandel." 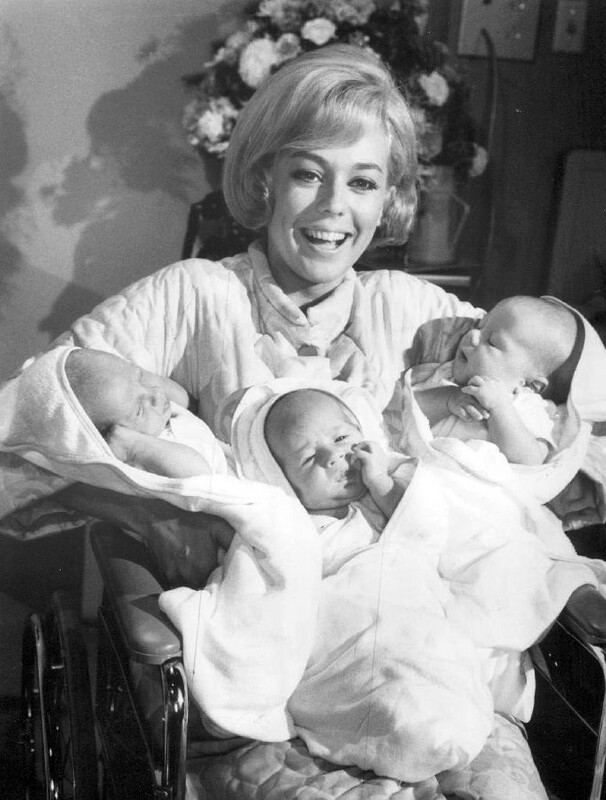 During the ninth season of My Three Sons, Robbie Douglas' wife Katie (Tina Cole) gave birth to triplets in an episode entitled "My Three Grandsons." The episode aired on October 19, 1968. The Douglas triplets, Robbie, Jr., Steve and Charley were played by real life triplets Joseph, Michael and Daniel Todd. THE OLSEN TWINS ON "FULL HOUSE"
Ashley and Mary-Kate Olsen played Michelle Tanner, the youngest member of the Tanner family, on the long-running ABC sitcom Full House. Michelle's last appearance on the show was in an episode entitled "Michelle Rides Again." in 1995, a two-part season finale. The character of Michelle was the Olsen twins' first acting role. 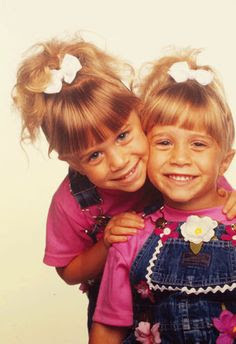 Born June 13, 1986, the Olsens were only infants when they appeared in the show's pilot, "Our Very First Show," which was first aired on September 22, 1987. Despite their similarity in appearance, Mary Kate and Ashley are not identical twins (from a single fertilized egg, which later divides). They are "sororal" twins, the female version of fraternal twins (from two separate fertilized eggs). TWINS ON "EVERYBODY LOVES RAYMOND"
Michael and Geoffrey Barone were the twin sons of Ray and Debra Barone on the hit comedy Everybody Loves Raymond, starring Ray Romano. The series aired on CBS from 1996 until 2005. Sullivan Sweeten portrayed Micheal Barone. 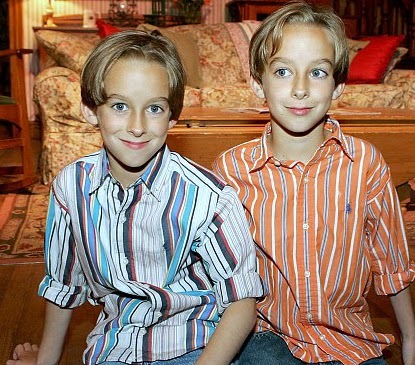 His twin brother, Sawyer Sweeten, played Geoffrey Barone. 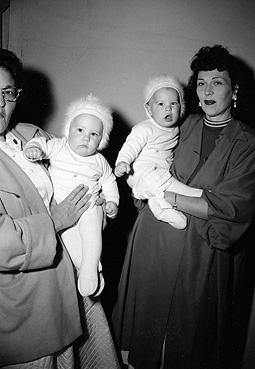 The twins were only 16 months old when they began working on the show. Their real-life older sister, Madylin Sweeten, played their on-screen sister, Ally Barone. Tragedy struck on April 23, 2015, when Sawyer Sweeten died in Austin, Texas of a self-inflicted gunshot wound to the head. Born May 12, 1995, Sweeten was just weeks away from his 20th birthday when he took his own life. DID YOU KNOW that phone numbers on North American television shows and films always begin with 555? to the Federal Communications Commission, the North American Numbering Plan Administration, began approving applications for these numbers from the public. There were applications from tax companies who wanted 555-TAXI or tourism companies who wanted 555-TRIP for travel reservations.